As everyone knows, this fourteenth day of Awakening, will be the best holiday of the year. You know what I’m talking about: it’s Anti-Valentine’s Day. The day of celebrating… not being in love. For those not in the loving spirit this month of Awakening, I have come up with some splendid ways to enjoy this brilliant holiday. You might be anti-Valentine’s, but you don’t have to be anti-fun. Who needs love when you have money? Play games like Destruct-O-Match and Haunted Shootery to take out your hidden grief from not exchanging candy and roses like all your Neofriends. Choose puzzle games like Cellblock, Pakiko, and Spellseeker if you need to give your mind a distraction from all the cheesy pink hearts of Valentine’s Day. Games are a great way to make plenty of Neopoints or give some good old restocking a go if games aren’t your forte. Now that you’ve got ridiculous amounts of riches, time to spend it all. Shopping is incredibly therapeutic and can be fun for the whole Neofamily. Buy gifts for your pets, your guildmates and yourself. Did you forget to give the niece/nephew a Day of Giving present? Not to fear, Anti-Valentine’s day is a great holiday to make it up to them. Don’t forget to pick up a little something for yourself- how about that stamp you’ve had an eye on for a while? All these stupid lovebirds are sitting around with their presents and candy hearts, but you’ve got the opportunity to get outdoors on Anti-Valentine’s Day. I would highly recommend the Lost Desert, but if you’re a little tamer, you can’t go wrong with Roo Island. Your pets will be very thankful for the memories you will make together. Even better, when the lovebirds ask what you did on (Anti-) Valentine’s Day, you can tell them you went on a giant vacation. It will be so satisfying to watch their reactions as they recognize they just wasted the best day of the year. Friendship is just as good, if not better than love. Have a day out with your pets, reconnect with old Neofriends, have a good time with your guildmates. No matter what you do, I’m sure it’ll be fun for everyone. If you’re feeling super generous and festive, send a Single Grey Rose to someone close to you. They will be sure to appreciate the sentiment behind it. 5. Teach others about Anti-Valentine’s Day! If all your Neofriends are obsessed with cheesy hearts and roses on the 14th day of Awakening, it’s up to you to show them that they don’t need the unsatisfying restraints of Valentine’s Day. Why not throw an Anti-Valentine’s Day party? If you are able to throw the party of the century, it might just convince your Neofriends that Anti-Valentine’s Day is the superior holiday. You’ll never be alone on the 14th day of Awakening ever again! You may have spent your Neopoints and not be able to afford that Zombie Paint Brush, but you don’t need Neopoints to enjoy time with your pets. Maybe indulge in one of your pets’ favorite hobbies or play catch on the lawn. Give all of your pets a good clean and maybe a little bit of hair gel or lipstick to jazz them up. Don’t forget petpet care! Take everyone to the park to stretch your legs. Pack a picnic and you’ve got a whole day of fun- minus the cheesy holiday that is Valentine’s Day. How very festive. You might feel a little down from not going with the mainstream Valentine’s Day festivities, but you can still enjoy the gift of giving. There are plenty of pets that would be stuck in the pound during this holiday season. Why not bring one home? Growing your Neofamily can never be a bad thing. If you don’t feel like handing out chocolate is appropriate during Anti-Valentine’s Day, there are plenty of other alternate gifts to give. A good book can be read over and over again; I would recommend something like Blumaroo Comedy or Kau Faerie Tales. Other gifts that will never go to waste are codestones or dubloons (if you’ve got more Neopoints to spare). Of course, there’s nothing wrong with going the old fashioned way and volunteering with your pets at the Soup Kitchen. The Soup Faerie will surely appreciate the helping hands! 8. Start a new hobby! There is no time to start a hobby like right now. While all the lovebirds are fawning over each other, you can turn your disgust at Valentine’s Day and delight at Anti-Valentine’s Day into unbridled productivity! Let’s face it: everyone has that one avatar they’ve always wanted, but have never had the motivation. This upcoming holiday is a time for setting those distractions aside and playing those games or collecting those items! Other cool ideas include: entering in site contests, trying the Beauty Contest or doing faerie quests. If all else fails and you just need to retreat from the world on Anti-Valentine’s Day, there are lots of quiet activities for you and your pets to do. 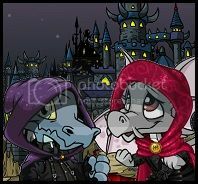 The Neopedia is an entire database of Neopet information and encyclopedia entries on Neopia and its residents. There are hours, even days worth of reading within it. My pets particularly enjoyed the story of Balthazar and reading about the origins of the Golden Ivy Leaves. If you ask me, the article on Dirt Pies made for a funny read. So what are you waiting for? Grab a mug of Hot Cocoa, grab your pets and pull up the Neopedia for hours of entertainment and education. There you have it, folks! Nine brilliant ways to spend this Anti-Valentine’s Day. Hopefully, now you will be able to have a great time with yourself, your Neofamily and your Neofriends. May your Anti-Valentine’s Day be the best you've ever had!